Amongst the lively streets of Hongdae, there is a special vending machine that has caught the attention of many. The vending machine in question is the “Flower Vending Machine”, near exit 9 of the Hongdae station. This vending machine sells 20 different kinds of dry flower batches, offering customers a wide variety of flowers to choose from. The news of its appearance caught fire on many different Social Network Service (SNS) platforms, becoming more popular with every post. 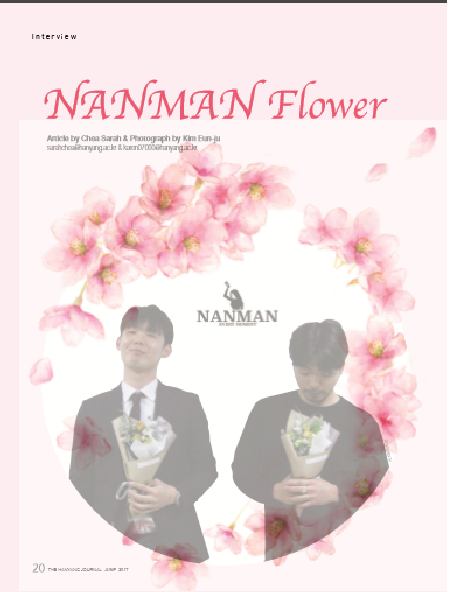 This creative idea was started by two young men, Ko Min-kyu and Kim Jinho, who came from Jeju Island to start their own business, “NANMAN Flower.” These two young CEOs have managed to reap success, thanks to their unique ideas and passion. Q. The “Flower Vending Machine” has turned out to be quite successful. Did you expect it to be this successful? A. When we first decided to start a business, we wanted to do something that others weren’t doing. Around the time, we were pondering about what kind of content to adopt as our business. Then, we saw a picture of a flower vending machine that was successful in England. The idea of a flower vending machine was new and fresh so we started with quite the conviction that it could also succeed in Korea. Q. The meaning of “NANMAN” is “floriferousness” or “being in full bloom” in Chinese characters. Why did you name your company “NANMAN Flower”? A. These days, there are many companies that name themselves in English. We did not want to be ‘just another company with any English name.’ We wanted to distinguish ourselves from others, which is why we chose to name ourselves in Chinese characters. On top of that, we thought the meaning of the Chinese characters represented the company’s ideal well. Q. Thanks to the success of NANMAN Flower’s vending machine, we heard that you just opened an online shopping mall. As representatives of the company, what do you think is the reason for your success? A. We don’t think our business can be called a “success.” However, we think the major reason why people think we are a success is because of our uniqueness. Before us, there wasn’t a ‘flower vending machine’ in Korea. We were the first to introduce such a concept in November of 2016. We were able to show the public that vending machines could also sell flowers, which we expect, was quite a shock to the public. It turned out that there was a huge market for people who need to buy flowers in a convenient manner. There are many people who hesitate to go to flower shops. We think our vending machine is of interest for these people since they can freely buy flowers without being aware of others. Plus, people who are interested could also pay with credit cards. Q. How do you select the designs and types of flowers in the vending machine? A. We choose flowers that are costfriendly so our customers don’t feel burdened by the prices. It is quite a misfortune because we are limited to provide more diverse flower batches. However, the most important factor for us is to provide flowers in prices that everyone can easily purchase. We try to select the maximum ranges of flowers with reasonable costs. 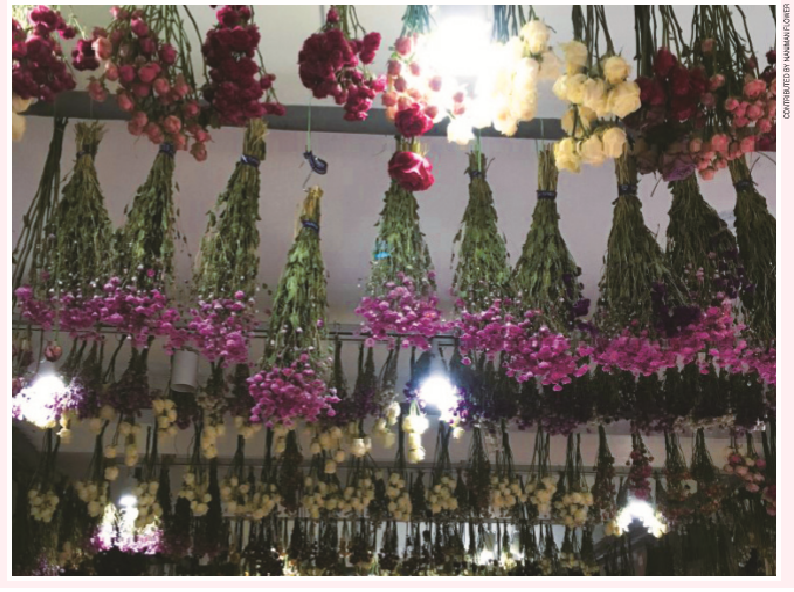 We chose to sell dry flowers because we think it’s best to preserve the flowers as long as possible. Q. Why did you decide to establish a business instead of choosing to get a stable job? A. Ever since we were young, we had always thought of starting a business. We consider ourselves as fortunate that we met each other because we both had the same dream. This is why we chose each other as business partners. We consider ourselves lucky because we could spend our own time investing in our start-up business and still were able to invest our time in doing hobbies. Q. What did you consider the most when you first opened up your business? A. The first aspect that we considered was of course the market we were going to target. Compared to people abroad, we thought that Korean people’s awareness of flowers was relatively low. After careful research, we thought that targeting the younger generation would produce more profit because they are more interested in flowers than the older generation. Q. Were there any problems when you first created your business? A. Of course we had many problems. Since we are from Jeju, we did not know anyone in Seoul. There was no one who could help us or give us advice. Being new was really tough for us. Also, everything about Seoul was new to us. Very minor procedures such as issuing receipts and buying products were not easy for us at all. Besides making sure that we could provide good items to our customers, there were so many minor factors that we had to take care of. We were alone to map our way through all the big and small troubles that we faced during the process. There was this one instance where we had to contact an enterprise that was responsible for making our machines. We were expecting the machines to come but there were so many problems that we unfortunately had to cancel the contract. However, the enterprise said they couldn’t refund our money. That was one of the most depressing moments in our short business history. Q. When faced with those kinds of hardships, how did you learn to endure them? time to think about the different ways we could approach this problem because we had to cope with the problem as fast as we could. On the bright side, I believe that those problems later became useful experiences that helped us on our path towards success. Q. Is NANMAN Flower planning something new? A. We are working to expand the flower vending machine business to be installed in more areas, not only in Seoul. We plan to build our vending machines everywhere in Korea. We hope to expand the business so that everyone can see our machines wherever they go. Q. What is the ultimate goal of the NANMAN Flower? A. When people hear “Samsung”, they all know about the company. Like “Samsung”, we want to expand our business until everyone has at least heard about “NANMAN.” We know that it’s going to take a long time to get to our ultimate goal, and we do expect that the path we are trying to take is going to be hard. However, we have each other and our trustworthy employees, so we are ready to take that journey. Q. Many university students in Korea dream about starting their own business. In fact, many students in Hanyang University are interested in starting a business. As successful CEOs, do you have any advice to give to these students? A. I think the most important aspect that one has to consider when building a business is to have a positive attitude. Taking the first step is always the hardest. When our flower vending machine became popular through SNS, many commented that they all had thoughts about building a flower machine. I think that the idea of a flower vending machine was on many people’s minds. But what really matters is taking that idea from your head and putting it into reality. When we first started our business, we went to many lectures about starting a business. However, wherever we went, the evaluations were all different. Many people said that it was going to be hard to succeed. However, we still took the first step. So, we want to tell students who are considering starting their own business to neither hesitate nor have fear about taking the first step. If you believe in something, proceed with it. You’re young enough to accept the challenges and have time to learn from your failures. Learning from your failures is crucial because that experience helps you succeed.